The rich history of Green Cove Springs is tied to the natural springs and the St. Johns River. Prior to the 1930s, the spring property was owned by J.C. Penney, who turned the property over to the City because of employment problems relating to the spring. Prior to that, however the area was first settled in the mid-1800s and was called White Sulfur Springs. After that and around 1850, Green Cove became a prime tourist attraction, famous for the warm, therapeutic springs. 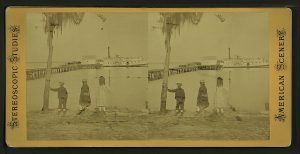 The sulfur springs, or the “boil” as it was called brought wealthy visitors down the St. Johns River by steamboat to vacation at the grand hotels like the Clarendon and Qui-Si-Sana. Visitors of the period included Henry Flagler and his new bride, the Astors and Vanderbilts. The visitors drank from the spring believing in its medicinal values. It is said one local physician prescribed the spring water for various chronic ailments of the liver and kidneys. There are those today that still have confidence in the therapeutic value of the springs and can be seen daily drawing water from the spring for consumption. strikes the water at midday, the sun projects prismatic hues. The 78-degree spring feeds the municipal pool and then flows down Spring Run into the St. Johns River. The spring and pool are both located in beautiful Spring Park, one of the prettiest parks in Northeast Florida, recently renovated to include a new pool, pavilion and picnic areas. Entering the pool is an invigorating experience and most refreshing since there are no chemicals used in the pool. system, one livery stable, one cigar factory, one jewelry store, one graded school system, a street railway, three meat markets, two steamers a day, two lines of steamers, two blacksmith and wheelwright shops, two artesian wells which supplied the town with pure water, and one white sulphur spring that furnished free water to everyone (Source: Randolf McCredie, North Florida Living, September 1984). a walking tour to the historic downtown district, which includes historic homes and a very unique restored theater. The City has grown slowly but steadily since 1900 and is now approximately 5,700. It is located in Clay County, one of the fastest growing counties in Florida. It is proud of its quaint, small town character that lends to a perfect place to raise families. The City provides three beautiful parks for visitors and has ball fields and tennis courts for everyone’s use. The schools in Clay County are ranked among the best, with families moving to Clay County in mass because of the quality of life that is offered here.The local economy is tied to nearby military facilities, service industries, shopping centers, retirement homes, as well as farming and mining. The area offers great opportunities for economic development as evidenced by the industrial areas located both north and south of Green Cove Springs. 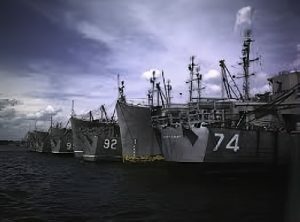 One of the industrial parks is the former Navy base, which housed the famous “mothball” fleet following World War II. The City is also the County seat which brings in many employees to the City each day. The Clay County School District as well as Clay County government contribute greatly to the community. 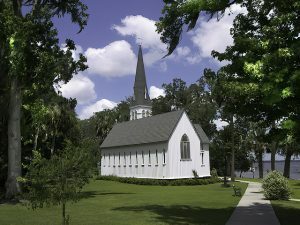 Visitors are encouraged to travel to Green Cove Springs and drive around to see the old homes and churches along the river and throughout the area. Also visit the “Old Courthouse” built in 1875 and now a historical site that is part of the “Historical Triangle” that includes the courthouse, old jail, and the Clay County Historical Society Museum. Green Cove Springs has had many changes but it still remains a beautiful, unique town with homecoming parades, Christmas parades and annual community gatherings in the beautiful parks.